A different view every week: The self-elevating, off-grid, luxury floating home « Adafruit Industries – Makers, hackers, artists, designers and engineers! “Floating houses are popular ways of living in some parts of the world,” reads the Arkup press release, “in particular the Netherlands, US West Coast cities and South-East Asia.” I can’t say I’ve visited the first two examples, but I’ve spent some time in the latter, and it seems a little tasteless to compare the humble bamboo houseboats of Cambodia to the floating luxury apartments these guys are selling. Still, the concept seems neat for those who can pay to play. 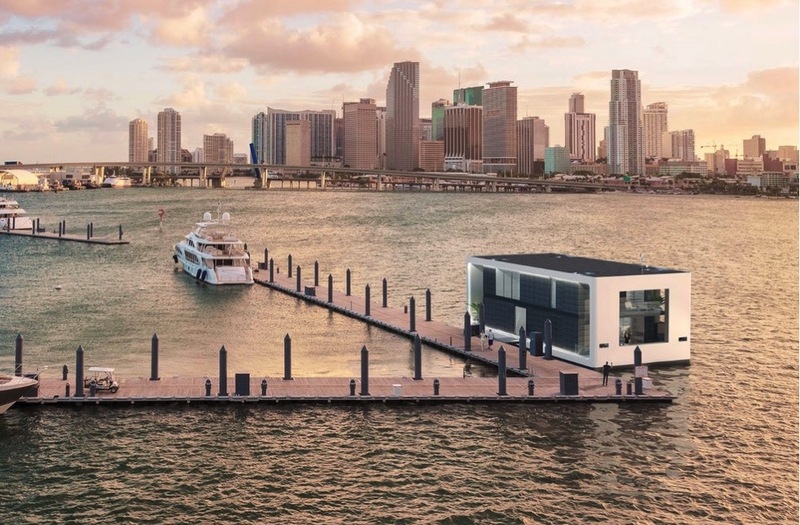 A self-contained, electric, double decker houseboat that can put down hydraulic legs to elevate itself out of the swells in water up to 20 feet deep. A liveable yacht that won’t make anyone seasick, and that harvests its own rainwater from a roof that doubles as a 30-kilowatt solar array, feeding up to 1,000 kilowatt-hours worth of lithium batteries onboard.